one of its subordinate companies will case their colors on Friday, Sept.
5, at 3 p.m., in preparation for the units' upcoming deployment to Iraq. Internment Facility, in support of Task Force Military Police-North. other life support for the detainee population. them into the Theater Interment Facility operations. DVIDS has a nice piece on Fort Lewis's 4-6th Cav. Click here. Follow this link from Black 5 - cool photos of 4-6 Cav Kiowa pilots firing a rocket in Mosul. FORT LEWIS, Wash. – Approximately 70 soldiers from the 23rd Chemical Battalion, are expected to return home Friday, Jan 25, and will be welcomed home in a ceremony at approximately 10:30 p.m. that evening at Soldiers Field House. The unit deployed to Afghanistan in January 2007 to provide Base Operation support to five different Forward Operating Bases (FOBs). During its 1 year deployment the unit provided life support functions such as billeting, security and range operations. Christmas in Baghdad was a special event for Army Private First Class Jason Talbott this year as it included a promotion to Specialist. He was promoted in a Christmas evening ceremony by Gen. David H. Petraeus, commanding general Multi-National Force-Iraq, with the assistance of the Jason’s father Lt. Col. Bret Talbott, USAF. Lt Col Talbott and Specialist Talbott are both deployed to Camp Victory in Baghdad, Iraq. 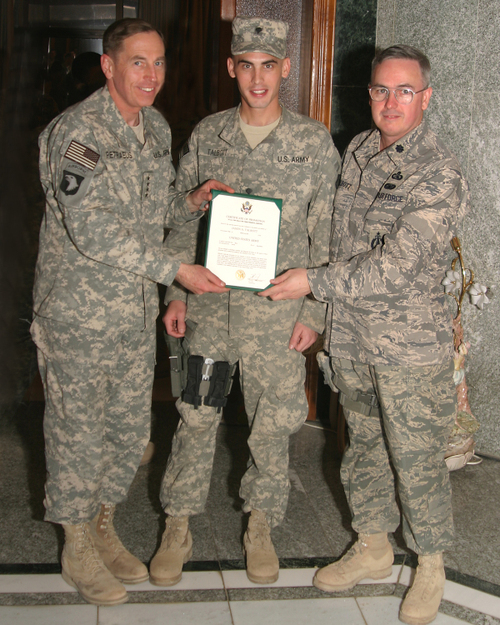 Specialist Talbott is a Combat Medic attached to General Petraeus’ staff while deployed from Fort Lewis, Washington. Lt Col Talbott attached to the Joint NetOps Control Center, an element of Multi-National Forces Iraq, is deployed from Langley Air Force Base, Virginia. 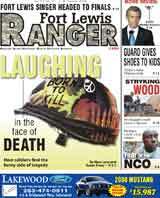 The Midland.com has a story on Fort Lewis Purple Heart Recipient Spc. Jeffrey Briley Jr.
(DoD Release) - The Department of Defense announced yesterday the death of a soldier who was supporting Operation Iraqi Freedom. Cpl. Blair W. Emery, 24, of Lee, Maine, died Nov. 30 in Baqubah, Iraq, of wounds suffered when his vehicle encountered an improvised explosive device. He was assigned to the 504th Military Police Battalion, 42nd Military Police Brigade, Fort Lewis, Wash.
CAMP LIBERTY, Iraq – In a war zone, casualties happen. Military medics and doctors have to be up-to-date in medical procedures and use of equipment in order to save lives. That is why the 566th Area Support Medical Company is upgrading several areas of the Witmer Troop Medical Clinic, to give better service to the thousands of Soldiers on the base camp. In an effort to keep the medical clinic up-to-date, one defibrillator on each of the two beds in the trauma room and another on a crash cart to roll wherever it is needed are part of the room’s setup. That was probably the biggest upgrade, said Boykin. “Before, we had one table in the center with a ‘Life Pack 10’ (an older defibrillator model), so if we had two patients who needed to be shocked, we only had one machine to do it,” said Boykin. Unlike older defibrillators, these are approved for aviation use and can also be used to check all the important vital signs, such as temperature, monitor the amount of carbon dioxide which the patient inhales and measures blood pressure and the oxygen level in it, he added. Personnel at the clinic said they feel it is their duty to provide the best care possible to troops. Another upgrade in the trauma room is the trauma beds. Now the beds are not just litters, but trauma tables on which the litters and other medical apparatus can be hooked onto conveniently for better access by medics when treating patients. These trauma tables also allow for fluid drainage. Although only two patients can be seen simultaneously in the clinic’s trauma room, the clinic has five additional exam rooms for less critical patients. The clinic also has its own laboratory, an X-ray room and a behavioral health specialist, as part of the team, for combat stress-related needs. Sometimes casualties have to be treated on the move, and that is when speed and precision are needed. Most military ambulances have cases with supplies high inside the vehicle’s interior. These supplies are usually needed quickly, so Boykin came up with some changes inside his ambulances, as well. The ambulances, the trauma room and the defibrillators are not the only upgrades in store for this TMC. Other projects are on the list for the upcoming weeks are adding lights and building an awning for patients in the outside waiting area and extending the concrete floor to form a trauma pad for quick access from the ambulance to and from the trauma room. They also planned to replace the vinyl floor with approximately 6,000 sq. feet of tile. The family of former Fort Lewis Chaplain Father Tim Vakoc, critically wounded in Iraq, is speaking out after the Veterans Administration pulled his benefits for speech and physical therapy. BAGHDAD, Iraq - The 514th Medical Company from Fort Lewis, Wash., held the first event of a basic medical skills training series with four Iraqi soldiers Nov. 11 at Camp Liberty. The Iraqi soldiers and their American counterparts, spent the day together reviewing proper techniques and procedures for safely moving a casualty from the point of injury to the transport vehicle and then on to the medical treatment facility safely and efficiently. The training also included each step of the basic trauma assessment that should be executed prior to casualty movement. Army Capt. Rodemil Fuentes, commander of 514th Medical Company, stressed the importance of events such as this training exercise. "These training events were developed based on the Iraqi soldiers' needs," Fuentes said. "Starting from the ground level of medical care on up, we will train with this group to be proficient in their medical skills, and our goal is that they may go out and spread that knowledge." The Iraqi soldiers expressed gratitude for the opportunity to learn such life-preserving skills. They understand the large role that proper medical aid and transportation play in the well-being of fellow soldiers. The consensus from the Iraqi soldiers was that while the training was new and different, they enjoyed it and looked forward to the opportunity to teach other Iraqi soldiers. This event is the first in a series of training events that members of the 514th Medical Company will conduct each Sunday. Topics will vary from week to week, to include basic life support, advanced medical assessment and wound treatment. The collaborative effort between 514th Medical Company and the Iraqi Ground Forces Command will give these Iraqi soldiers a comprehensive knowledge of basic medical skills to execute in a time of need, U.S. officials said.